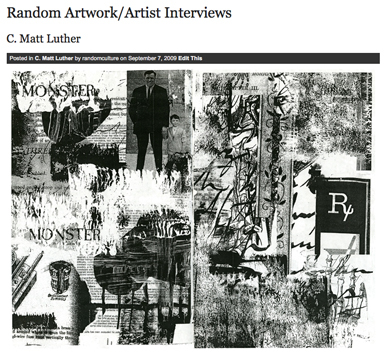 An interview with C. Matt Luther is now posted on the Random Artwork/Artist Interviews site. C. Matt Luther is an artist currently living in Milwaukee who works across various mediums, from traditional forms such as painting, drawing, and printmaking, to more ephemeral forms like zines and street projects. Collage is at the center of all of his work, as well as a critical attention to forms of mediation we are surrounded by in our daily lives. The interview includes downloadable PDF versions of some of his recent zines! Click here to read the interview. Check it out!